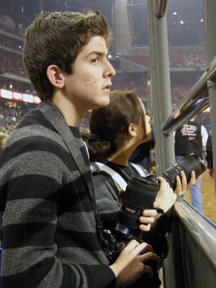 Alex Benito shoots pictures at a Houston-area rodeo. Benito was the sixth Texan to be named JEA’s National High School Journalist of the Year. It began two years ago. I sat at my desk, cursing the scientific world for its failure to have perfected the human cloning mystery. I desperately wanted, no needed or so I thought, to clone Marcelino Benito, the 2006 National High School Journalist of the Year. Accepting the inevitable, I began a new school year for the first time in four years without his talent, presence and leadership on the publication staffs. What I did not expect was the impact his younger brother, Alejandro, Alex to his friends and peers, would have the next two years on the journalism department at Cypress Falls High School in Houston. The accumulation of experiences ended in Alex being named the 2008 National High School Journalist of the Year, thus placing his name and Marcelino’s in the history books as the only siblings to have ever won the award, which results in the $5,000 Sister Rita Jeanne Scholarship from the Journalism Education Association. During Alex’s sophomore year his talents and interests in photojournalism began to appear through staff assignments and on the pages of the newspaper and the yearbook. “Because of photography I have been able to make my mark as an individual,” Alex said. “Through photography I am finally able to tap into my own talents and skills” – skills he furthered honed as a wire service photographer for EFE News Service. Following in his brother’s footsteps Alex began working for the international service as a novice professional photographer. Alex’s personality shows in his photos. When viewing his photos, one sees the intense serious side of Alex as he captures the pain and the agony on an injured player’s face. “It’s as if the photos I take come to life with every simple push of the shutter button,” Alex said. However, his contagious laughter and unique humor clearly surface in his candid and feature shots of students and of friends – “sweet photos” as Alex refers to them. “I enjoy the aspect of being able to tell a story, to stop time, be it for only one second, and capture a moment which lives on forever,” Alex said. As a senior, Alex accepted the challenge of editor-in-chief for Cypress Falls’ first online newspaper, The Wingspan Online. I had explained to Alex at the concept of the pilot program, he would be the person writing the majority of the stories and doing most of the work. The online paper was basically a one-man show, “The Alex Benito Show,” with guest appearances by the newspaper and yearbook staff contributing a few stories and photos when needed. At the April convention in Anaheim, where the award was announced, brothers Alex and Marcelino sat in the back, nervously waiting for those attending the awards ceremony to find seats so it could begin promptly on time, they hoped. Alex, appearing calm and somewhat indifferent to the chaos happening around him. Marcelino, more nervous than when he had been a candidate. “I sat shaking,” Alex said. “Every time they called a name and it wasn’t me, it was like the next one could be me, maybe? Marcelino, who had been through the process, began to pick up on the clues around him. When they announced Alejandro, “I had to turn to him and say, ‘I think that’s you,’ ” Marcelino said. As for me, no I didn’t get the clone I was searching for. I got something better: an original Alex Benito. At Cypress Falls High School, which has about 3,500 students and is located in Houston, Alex Benito ended his journalism journey as the first editor-in-chief of the school’s online newspaper, The Wingspan Online. Superior for photography portfolio (2007), Journalism Education Association. Texas Journalist of the Year, Texas Association of Journalism Educators – the $1,500 Bill Taylor Memorial Scholarship.